through education. Dorothy was a person of deep faith, with many gifts and interests. She enjoyed traveling all over the world, watching golf, shooting archery, painting, calligraphy, singing, reading, and filling out crossword puzzles, but spelling the words backwards. Dorothy is predeceased by her parents, her brothers, and her husband. She is survived by her loving family members: Dave Allison, (Leslie), Braden, Camden and Katie; Sue Riggle, (Rick), Cassie, Jonathan, Maddie, John, and Ainsley; Donald Allison and Kasey; Nancy Mikoski, (Gordon), Peter, Charissa, and Anna; Marianne Schaffer, (Brian) and Kylee. 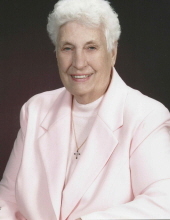 Dorothy’s memorial service will be held at Pennington Presbyterian Church, 13 South Main Street, Pennington, New Jersey, on Sunday, June 9th at 2:00 pm. In lieu of flowers, memorial contributions may be made to Pennington Presbyterian Church or to Pilgrims of Ibillin (Pilgrims of Ibillin ℅ Jitasa, 1750 W. Front St, Suite 200, Boise, ID 83702). “In life and in death, we belong to God.” Arrangements are by the Wilson-Apple Funeral Home, 2560 Pennington Road, Pennington. Condolences are welcome at www.wilsonapple.com. To send flowers or a remembrance gift to the family of Dorothy C Allison, please visit our Tribute Store. Guaranteed delivery before Dorothy's service begins. "Email Address" would like to share the life celebration of Dorothy C Allison. Click on the "link" to go to share a favorite memory or leave a condolence message for the family.